TravStar1 Point Of Sale SystemManager's Work Station Daily ProceduresHow Do I Run a Department and Inventory Sales Report? 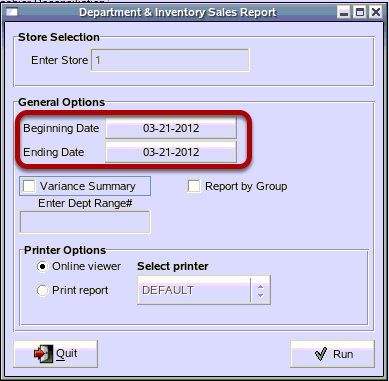 This lesson will teach you how to run the Department and Inventory Sales Report. From the Daily Procedures tab, click on the "Dept/Inv. Sales Report" button. The Department & Inventory Sales Report will display all sales information for a given date range. It is a comparison report showing the sales which were entered into open departments, versus those that were entered under PLU numbers at the register(s), and their corresponding margins. Click inside the Beginning Date and Ending Date boxes to chose the report date range. These default to today's date. (1) Click inside the check box beside Variance Summary to report any variances that may exist. The Enter Dept Range# field is only available if the Variance Summary box is checked. Leave this field blank to report all departments or limit the report by establishing a range. (2) Click inside the check box beside Report By Group to only show department groups on the report. This is an example of the Department & Inventory Sales report. This is an example of the Variance Summary report. 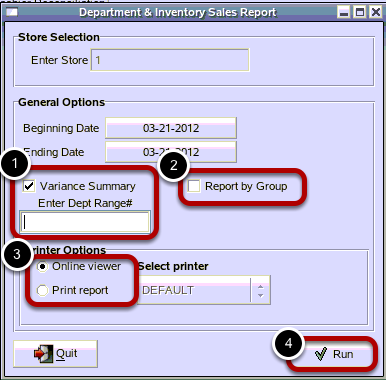 This report is only ran when the Variance Summary option is checked. Prev: How Do I Close the Day on the Manager's Work Station? Next: How Do I Run a Shift Report?